Gear Offer is the first peer-to-peer marketplace designed to take the pain out of buying and selling used camera gear online. We'll save you time, frustration and money when buying and selling used camera gear. Listing your gear for sale is simple, and it's free: set your price, add a description, a few images and you're done. We provide pricing suggestions, make your gear discoverable to buyers and pay you directly and quickly when your gear sells. Buying used gear is as simple as clicking "buy now" at the set price or making an offer to try for an even better deal. Once your purchase is complete, the item is marked as sold, the seller ships it and you'll get tracking updates all the way to your front door. 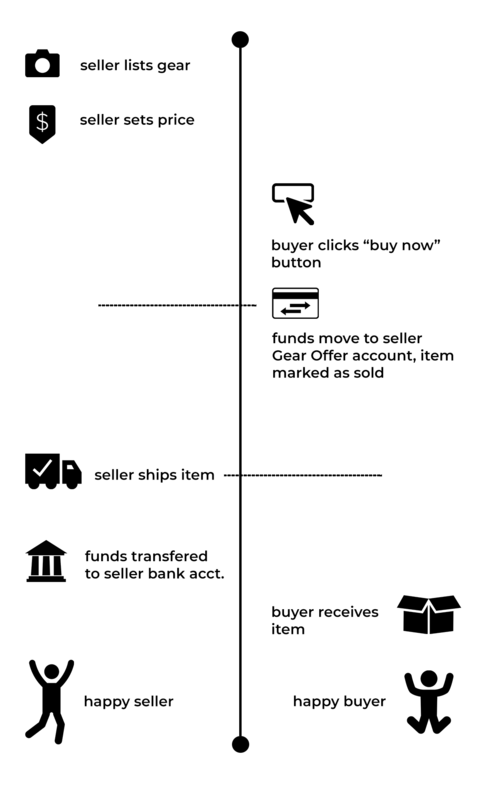 There's no back and forth with flaky people on Gear Offer, just serious buyers and sellers. Anyone can easily find what they're looking for. We work behind the scenes to match the right gear to the right people. Every user and transaction is continually evaluated for fraud prevention and every transaction is subject to rating and review. We back our service with Gear Offer Assurance and great customer service because we ❤️ photographers. The only fee we charge is 6.9% of the successful sale total to the seller. Listing is free and we pay our sellers directly. There are no payment processor fees or transfer fees. Just one low fee. Compare that to eBay at 10% + 2.9 + .30 for minimum of 12.9% + .30. When you buy used camera gear, you can always make a reasonable offer to try for even lower price than what is listed. Sellers win by paying one low fee. Buyers win by getting the best price possible. 邏Gear Offer is the smarter way to buy and sell used camera gear.